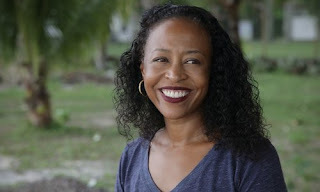 Ladee Hubbard is the author of the novel The Talented Ribkins. She says the book's title and many of its themes were inspired by the work of W.E.B. DuBois. Hubbard's work has appeared in a variety of publications, including Guernica and The Times Literary Supplement. She lives in New Orleans. Q: The Talented Ribkins takes place over the course of a week. Why did you decide on that time frame? A: Honestly it was largely a practical consideration. In that sense, giving the novel a limited time frame was a way to increase tension and create a sense of urgency. There is a lot of backstory to the novel and I wanted to make sure that this was balanced by a real sense of forward momentum. Q: Your writing has been compared to that of Toni Morrison, Colson Whitehead, and Thomas Pynchon. What do you think of those comparisons? A: They are flattering, to be sure. I am greatly inspired by many writers and especially Toni Morrison who was my thesis advisor in college. A: I did not know how the novel would end when I started writing it. The novel actually began as a short story which, although significantly altered, is now the first chapter of the book. I published the story and realized I wanted to tell more about the characters, particularly Johnny and his niece, Eloise. So the novel really began with the characters and my desire to explore who they were and the dynamic between them in greater depth. A: Right now I am working on two projects. The first is collection of short stories which are all narrated by members of a single African-American community in Florida. They take place over a 20-year period (1988-2008) and document the changes the community as a whole undergoes during that time. The second is a historical novel. One of the main characters is the grandfather of Johnny Ribkins. He invents what becomes a nationally popular meat sauce and tours the country giving cooking demonstrations. He takes to calling himself The Rib King, which is the origin of the Ribkins’ family name.